Please complete our online Screen-flex PVC screen enquiry form or contact us directly to discuss your requirement and for a price. PVC-Strip specialises in the manufacture and supply of PVC screens, PVC partitions and PVC sectional dividers. Manufactured to your requirements these one-piece PVC screens are a flexible and economical solution for reducing heat loss, controlling humidity and for separating dust, smoke and fume pollution in industrial, warehouse and commercial environments. These products are completely bespoke to your unique requirements, please take a look at the table below to view the customisable options. They are extremely versatile and are used extensively to create welding booths, spray booths, warehouse and commercial dividers. Screen-Flex is a range of heavy duty PVC screens used within the industry to create moveable barriers, permanent screens and ground and product covers. We utilised various weights and grades of PVC coated cloths and clear PVC films to create your ideal partition, cover or welding screen. Within the range you can mix colours (full-colour list below) with clear PVC to create screens with vision sections or use block colour for privacy. We can include eyelets for fixing along the top and sides, access points, weighted bottoms and Velcro seams to ensure you achieve the optimal solution for your application. The screens can be fully retractable and move from the top using either our robust Slide-20 sliding track system or our more lightweight and economical tension wire kit. What are you using the PVC screens for: Spray booths, welding bays, sectional partitions? Do you have any fire retardant requirements? Do you requirethe any access points, weighted hems or Velcro seams? PVC screens are used extensively to maximise space in your warehouse. Split workshops from storage areas; create privacy from show rooms and to create temporary workshop dividers. PVC screens are ideal for creating clean areas and to create smaller areas for heat containment. 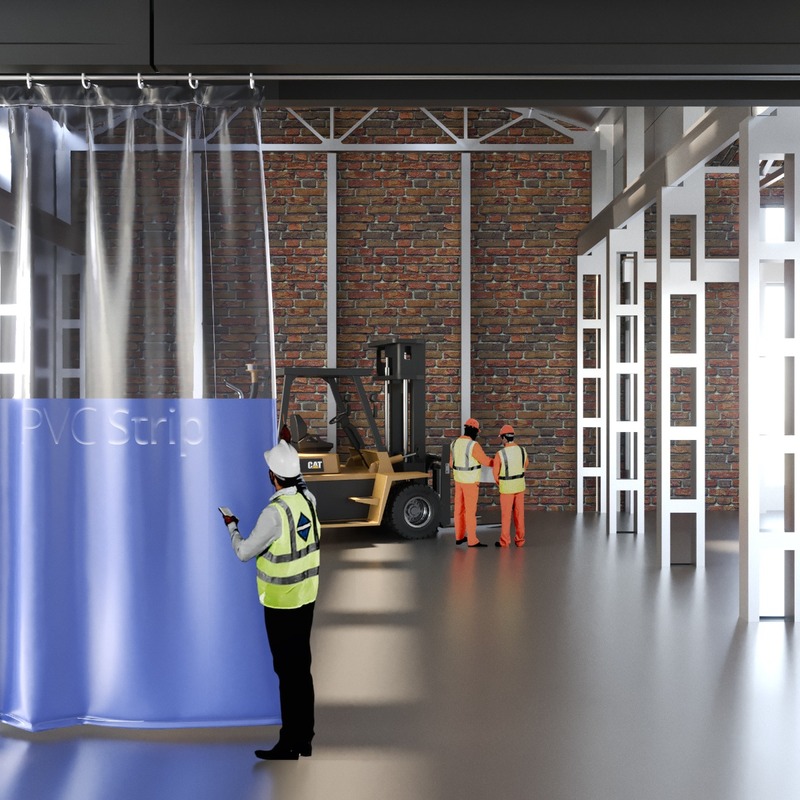 PVC screens are ideal as spray and cleaning booths, where the PVC screen needs to be open for access but closed during the spray / cleaning process to keep dirty and clean areas separate. PVC screens block contaminants and help to direct hazardous fumes for controlled extraction. Ensuring protection for workers by blocking sparks from arc welding and blocking dangerous UV, protecting workers in the area. Maximise your space by separating areas, whether it's splitting classes by gender, the type of class or to provide one to one training. The PVC screen can ensure each class has privacy, reduces the risk of distraction and maximises the space and use of your facility. PVC screens will get dirty and should occasionally be wiped down with warm, soapy water. Do not use chemicals to clean this product as they can react and cause clouding of the PVC. Ensure they are left hanging vertically when you wipe the screen down, if PVC is left in water it can cloud over time.